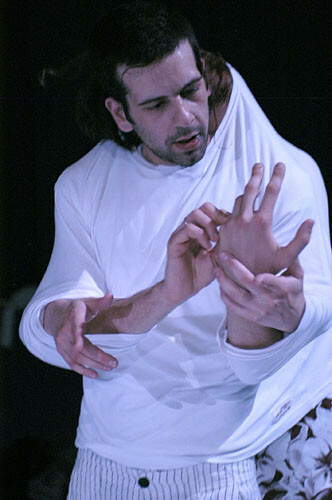 In FOOL FOR YOU, COCOONDANCE examines the phenomenon of the idiot or fool. They have always existed, everywhere, the village idiot, the eccentric, the lunatic with his completely individual view of the world. Some are amused by him, others afraid. At times he is a saint, other times a pariah. But he is always the disturbing-strange mirror of our own normality. *Music from René Aubry ("Ne m'oublie pas"), Camille Saint-Saëns ("Der sterbende Schwan"), Residents ("Icky Flix"), Bagdasarian ("The Alvin Show Theme"), Prince ("Nothing compares to you") performed by Jimmy Scott, Johann Sebastian Bach, "Goldberg-Variationen" performed by Glenn Gould (Recordings from 1955 and1981).